Mechanical etude. Research Lab in the smallest area. 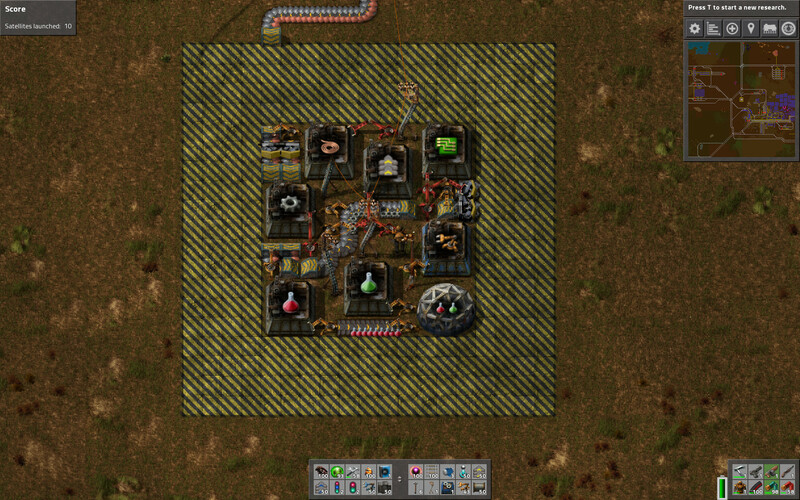 I suggest your attention a mechanical task of creating a compact research complex. It happened I have been needed researching in very small area. It does not matter why, but the goal was an ecologically clean lab in the woods (for don't disturbing nearest bites). And was born the idea of maximum urbanization. After complete my challenge I thought it may be interesting puzzle for someone. The minimum area's size I reached is foursquare in 11 cells. I hope someone will be able to improve the result. The goal: in region 11x11 cells organize autonomous research complex. 1. Delivery of resources to the area conducted with a maximum of two underground belts (one for copper, one for iron plates). On which side of the transport belt the plates are, and if both types of plates served with on belt is your choice. Also available electricity. That is all. You can choose any position of underground belts and electric pole. 2. Take into consideration that the possible long-term cessation of feeding any of the three resources. 3. At a distance of 4 cells from a area should not be a single device / construction (based on the maximum length of the underground belt - 4 cells). Thus we maintain a maximum of trees. 4. The area should contain at least one working laboratory with red and green flasks. 5. It is believed that we have completed all the research that require only red flasks. And there are no other studies. Accordingly, we will use the most simple mechanisms and structures. 6. Welcomes any reduction in the required area (primarily) and electricity consumed (i.e. 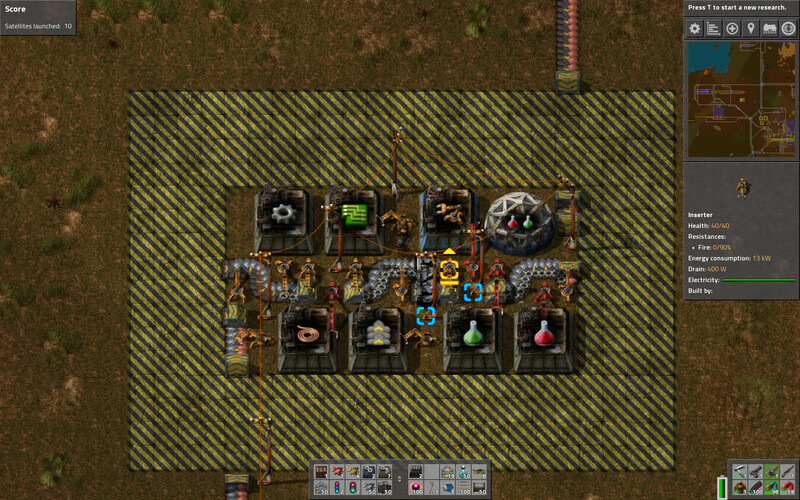 better to use two long inserters at 19kV than three common inserters at 13kV). Below is an example of resource delivering into the territory and working laboratory that we aspire to. P.S. My english is not good, so please let me know if I made mistakes. Re: Mechanical etude. Research Lab in the smallest area. Well, it works... looks kinda nasty though. Last edited by Nubm2 on Sun Jan 22, 2017 4:35 pm, edited 1 time in total. Nubm2 wrote: Well, it works... looks kinda nasty though. Oh... Well, it didnt work without them so i had to try again. Last edited by Nubm2 on Mon Jan 23, 2017 10:07 pm, edited 5 times in total. It is better hide answers under spoilers. Better view and someone perhaps will not want see the answer before he tried. Anyway good job. Next step is 10x11. Unfortunately there is 2 poles required in the void zone. I've tried several setups for the 10x11 but all failed. Its just not enough room to insert stuff. This is one example, all whats missing is iron for the belts (bottom center). Its even possible to change the setup around but the real problem is the southern pole. 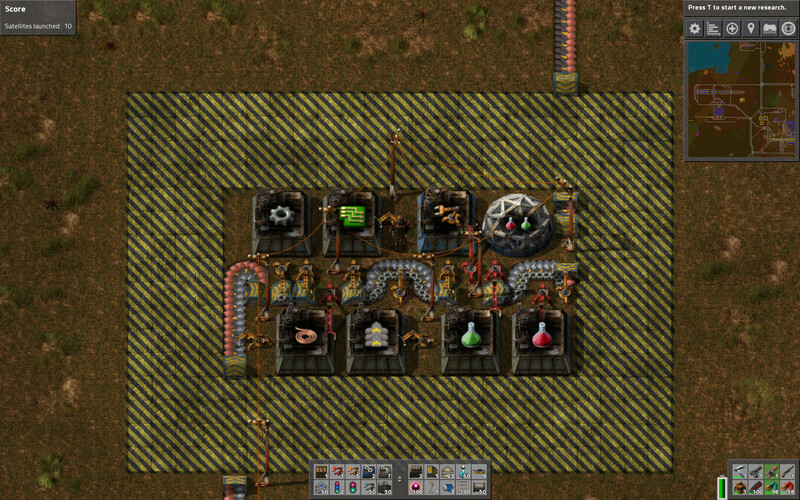 I'd need the all 6 squares between the assembling machines and therefore its impossble to power the inserter right next to the iron input. Even another input from the left wouldnt help, since there is only one possible point to enter anything into the belt machine. And i had the same (or very similar) problems with different builds. Im running out of tricks. I have one more approach though... Trying to get iron gears and copper mixed on a second input after everything that needs those is satisfied, to finally feed the red science packs last. Maybe that will buy me some room. Another approach is try buid in 8x15 (or something like this), couse 8x15=120 instead of 11x11=121 and area is most important resource. But I failed it too. But still, love the design. [Edit2:} Dang, made the same mistake. 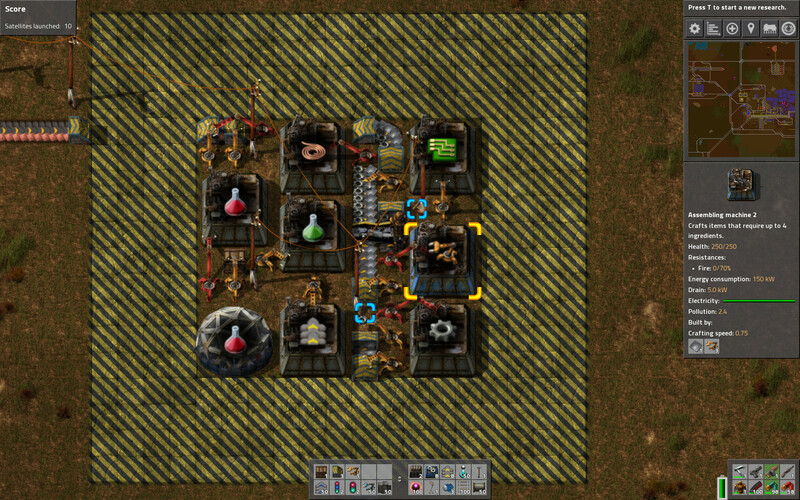 Got rid of the inserter on the left because its not needed. I'm glad to inform, that 10x11 area solution was found. 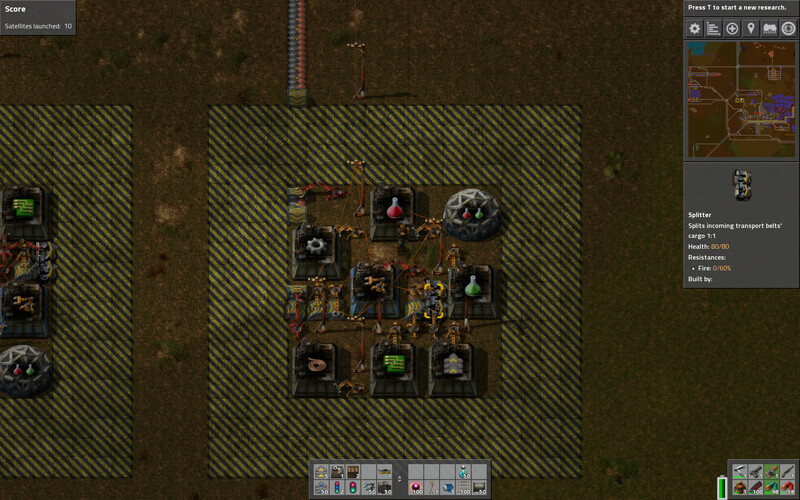 Next step is 10x10 and laboratory with 3 flasks within. Green researches are available. Reminder: if someone wants to place his decision, please let it be hidden under the spoiler.